This is it. Camellia sinensis, the plant that is harvested to produce tea. Well, not this plant, per se, as this little plant is my very own precious tea plant, a gift from my sister last June. I've been nurturing it, talking to it, watering it, admiring it, misting it, just about everything I can think of to coax it to grow. It has a few little new sprouts, it wants to do something big, but it seems to hold back. Okay, so Pennsylvania doesn't have the ideal growing conditions for a Camellia sinensis plant, but I'm hopeful it will grow into a larger more impressive plant! I'm tossing this out to the blogging community to inquire if anyone has any suggestions, ideas, recommendations, that I should try in an effort to encourage, perhaps even inspire, my little starter plant to grow. Take this collection of readily available ingredients, and turn it into this precious circle of chocolate mice. We first enjoyed these little mice at The Corner Rose Tea Room in Orlando Florida. She told us that these are her signature dessert, and she always includes them on her tea tray. These are quick and easy to prepare and fun to serve. Rather than serving them on a regular basis, I think they would be prefect for a Cinderella themed event, don't you agree? To prepare, melt some of the semi sweet chocolate in a microwave safe cup. Unwrap the Hershey's kisses, set aside. Dip the Maraschino cherry (holding it by the stem) into the melted chocolate. Place onto a wax paper covered tray with the stem turned upward. Attach a Hershey's kiss to the chocolate covered cherry. Gently slide two of the sliced almonds in between the kiss and the cherry. Once you have a tray full of mice, chill in the fridge. I added the eyes just before serving as the writing gel doesn't become firm and can easily smudge. Afternoon Tea at Sweet Remembrances typically begins with a fresh salad. Today, for SereniTea Wednesday, we served a strawberry salad sprinkled with walnuts and drizzled with a sweet poppy seed dressing. After the salad, the three tiered tray laden with goodies appears. We like to vary the assortment of sandwiches. Today we served rolled asparagus with a honey curry mayonnaise. There was an egg salad sandwich topped with a fresh violet and burnet leaf, a sliced chicken sandwich with apricot and currant conserve and a toasted pumpernickel square with Swiss cheese. Today's scones included traditional English cream and Cinnamon Chip scones served with fresh fruit, clotted cream and jelly. The top tier featured the desserts, a strawberry jelly roll, a crunchy currant cookie, and little chocolate mice. A wide range of loose leaf teas are offered, with the opportunity to select a second pot with a different flavor. Guests are encouraged to sit and enjoy their tea tray, visit with each other, and simply relax and savor the moment. Following tea time, a visit to the Rosemary House is always encouraged. This fun little tea themed photo album holds years of tea time memories. The journal underneath it documents the experiences, the decor, the design, the food presentation and the good times enjoyed during countless tea room visits over the years. In the beginning I was much more diligent in noting the tea rooms that we visited, and now the photographs of tea room visits are stored on the computer instead of in the photo album and the tea room visits are documented on this blog. The memories, whether in the journal or on the computer, are still priceless. The photo below was taken at the Black Rose Tea Room in Hanover, PA in October, 1998 with a friend. We enjoyed a Tomato Basil Soup that I noted to be very thick, very flavorful, and topped with a Parmesan cheese garnish. The soup course was followed by the three tiered tea tray. The bottom tier held crunchy cranberry pecan scones, two each. Warm, very nice. The middle tier had pita bread filled with Stilton cheese, pears, and currants, a nasturtium leaf sandwich with spring onion, and a tine ham and cheese quiche. The top tier included apple crumb square, chocolate covered, cherry, pumpkin bread with lemon cur, a chocolate filled shortbread cookie and a mint candy. This tea room was noted to be 'our favorite' at the time. Although I didn't describe the tea, I selected one called Whispers from Heaven and my friend chose Victorian Garden. At the time, even now, I will get anyone I can to join me for afternoon tea. There are years worth of visits to tea rooms across the state and beyond. My sisters, my brothers-in-law, the nieces and nephews, along with my dad, and friends make up the memories held within the pages of the photo album and the journal. It's fun to turn back the hands of time and remember the many opportunities to take tea that have been enjoyed. And exciting to discover and visit tea rooms that haven't been experienced before! Did you ever find a fairy near some budding little thickets,..
She tumbles through the daffodils, playing hide and seek. Discover what our local Downtown Businesses and Guest Vendors can provide for Your Wedding. Stop into any of the participating businesses to receive a map and guide to the location of these businesses. This past Monday, I attended Penn-Cumberland Garden Club, which is comprised of an inspiring group of 130 women who are interested in the environment on many levels. Gardening of course, horticulture, flower arranging, pressed flower designs, herbs, vegetables, flowers and birds. Birds were the theme for the meeting. Ways and means sold bird house while the "Share your Passion" committee had Audubon Magazines out for the taking. The luncheon table featured egg salad. 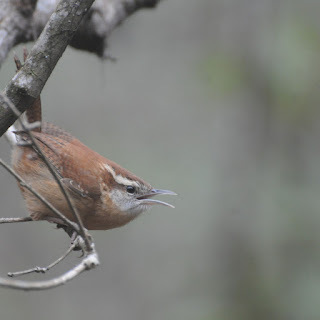 The program was given by Chris Rebert, a naturalist at Wildwood, our urban wetland park. Chris taught us how to identify birds based on markings, habitat and song. His program was excellent. Many songs can be easily recognized when you learn to put words to the sounds. 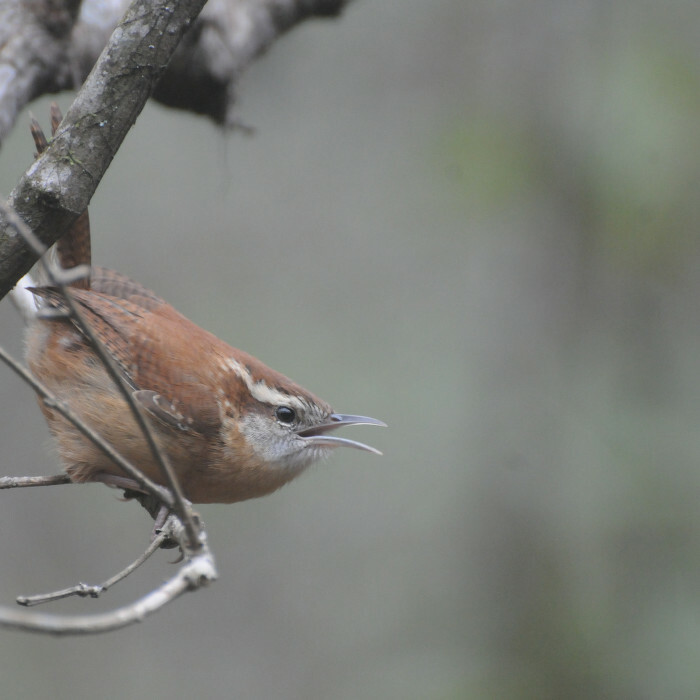 The call of the Carolina Wren is "Tea Kettle, Tea Kettle, Tea Kettle". Follow this link which takes you to the Cornell Lab of Ornithology website where you can here this call. 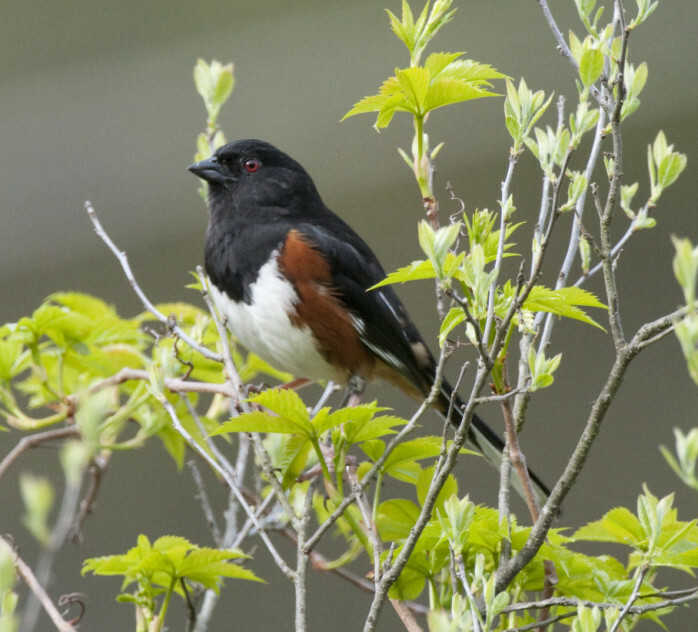 But my favorite call and song came from the Eastern Towhee. The female is pictured above and the male is pictured below. It's call note says "Drink, Drink" and the bird's song is "Drink Your Tea". Don't believe me? Listen here. This past week, a friend and I had the opportunity to visit the Coventry Tea Room in Pottstown, PA. This beautiful old building, crafted in 1790 served as a colonial farm. Later, it became a stop on the underground railroad, served as a doctor's office, and as a family home. It has quite a heritage, and is now serving as a bustling tearoom/restaurant to residents of Chester County and travellers from afar. Teacups and teapots adorn the many shelves and little hidden niches tucked throughout the building. There is a large menu from which to order, making the decision difficult! Since we were specifically on an Afternoon Tea outing, we both selected the Afternoon Tea Sampler Platter which featured a variety of tea sandwiches, a choice of soup, beverage, and dessert. Be forewarned, the hot tea offered is an assortment of Bigelow or Lipton tea bags in a basket accompanied by a pot of hot water. My soup selection was a Cream of Asparagus with roasted yellow pepper while my friend selected the Chicken Minestrone. Both soups were very tasty. The sandwich platter included egg salad, chicken salad, ham and cheese, zucchini bread, and a cucumber with cream cheese. There were fresh slices of fruit and veggies and a homemade coleslaw and olives. This little plate packed a nice variety of flavors and textures. For dessert, I selected the chocolate raspberry cake and my friend chose carrot cake. Both were moist and tasty, and long gone before a picture could be taken. We sat and visited for just shy of three hours without feeling rushed. There was a steady stream of guests during the lunch hour, and from observing the other lunch plates, a variety of menu options were served and portion size appeared generous. This was a fun place, a perfect blend between tea room and restaurant. This little cutie, Cooking for Profit touts itself as being the First Practical Hand-Book for Tea Rooms. Published in 1922 and written by Alice Bradley, she pulls from her expertise as the Principal of Miss Farmer's School of Cookery in Boston and culinary editor for the "Woman's Home Companion". In this book, she covers the money-making opportunities to be found in food service where women are shown how to establish and conduct a profitable business. Original ideas and recipes are included. Chapters include specialty cooking, cake and cake making, catering for social occasions, special luncheons and suppers and dinner parties. A complete chapter is dedicated to tea room management, with the beginning statement that interest in opening tea rooms is wide spread, from the Atlantic to the Pacific. Requisites for a successful tea room include good location, unusual or expressive name, distinctive decorations and furnishings, absolute cleanliness, competent hostess or manager, wisely chosen waitresses, effective advertising, food beyond criticism and correctly priced, and care in business management. All very good advice even now. Photographs throughout the book feature tea sandwiches (shown here), tables set for formal dinners, and also a tea room in a department store that was designed and managed by one of the author's students. This catering and food service management guide was a gift from my mother in 1988, two years before Sweet Remembrances opened. It has been fun 'rediscovering' the information and advice tucked within these pages. Recipes for tea sandwiches, menus for formal dinners, and all around useful advice still appropriate now. Although, iced drinks for 25 cents, chocolate fudge cake for 15 cents, and baked lobster cardinal French pastry, and coffee, tea or chocolate for $1.35 might suggest prices of a different era. Bonsai (pronounced bone-sigh) is always a joy for me to admire. I am not sure I have the patience and dedication it takes to maintain these beautiful tress and landscapes but I do love to look at them. These photos where taken at the exhibit by the Susquehanna Valley Bonsai Club at the recent PA Garden Expo. It was particularly fun to see the azalea in bloom! We have featured more of their work on our blog before. The overriding theme this year in the landscape exhibits at the PA Garden Expo in Harrisburg was out door kitchens. Complete with you name it: sinks, beverage taps, brick ovens, grills, mini refrigerators, roasters, gas fires and of course seating areas. The kitchen was hardscaped nicely and often next to a waterfall or privacy shrubbery. It's always fun to see the creative ideas and to dream. At the recent PA Garden Expo in Harrisburg, I spotted this lovely display of new varieties of Hellebores. The Hellebores are often called Christmas Rose or Lenten Roses because they will bloom out of doors in foul weather. Perfectly hardy from Zones 3 through 8, these plants survive well without any kind of protection from the weather. Best to plant them where you want them and not try to move them later. Not related to roses at all but they are members of the large buttercup family. They always yield a wealth of showy blooms that last for weeks. The colors range from pink, through white, brownish purple, some are spotted, striped or edged with contrasting hues. They have a long medical history of being listed as both medicinal AND poisonous. So it is not a herb plant that we use in any way other then enjoying the brave flowers in the garden during the wintry weather. The purplish colored plants are part of the "Under the Sea Coleus" collection, winner of the Hot New Plant of the Year award for 2012. 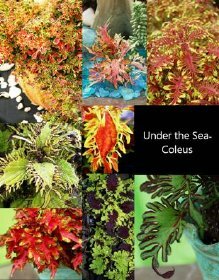 Hort Couture is the promoter of many avante garde annuals including the new Under the Sea Coleus which were voted the winner of the third annual Garden Idol competition held by the American Nurseryman and Landscapers Clinic. Under the Sea Coleus were bred by college students in Canada, and the royalties go back to the university greenhouses and horticulture program. Look for these coleus, with fun names such as hermit crab, molten coral, gold anemone and lime shrimp at independent garden centers. I spotted them at Stauffers of Kissel Hill. One of the fun parts of going to different herb and flower shows is running into talented and clever friends who always come up with fresh designs. These gardens are the work of Judy Bono, owner of The Gardener of the Owl Valley in York, PA. I love the water features and the little animals she finds to add to the gardens. My photography does not do this gorgeous piece justice! Another surprise in the Cypress Gardens of Legoland was this fabulous Banyan Tree. Angelica remembered this tree from the Swiss Family Robinson books. When studying this seventy-three year old tree (planted in 1939) it is difficult to figure out were the main trunk really is. The additional roots it puts down to help hold itself up in wet soil develop into such thick trunks themselves we weren't quite sure where the original tree was! As we travel we enjoy learning about the plants that we don't have here in PA. Certainly this caught our eye. The growth habit of these Bald Cypress Trees has this distinctive root function. Scientists aren't completely sure why they do this: part of the reasoning is for balance in the muddy, swampy water. Some scientist have thought the Cypress tree does this for oxygen. The knees are hollow and are often cut off and sold or carved. Cutting off the knees does not seem to harm the plant in any way. 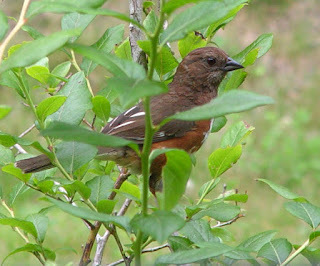 The knees can reach 3 inches and up to 5 or 6 feet above the ground depending on the depth of water the tree is in. On our family vacations we try to do something of interest to everyone. This has become a wee bit easier as the young ones are growing older and more understanding. In this case it was fairly easy to get everyone on board as the entrance to the Historic Cypress Gardens is through LEGOLAND! Cypress Gardens, in Winter Haven FL, was established in 1936 as a theme park. Often labeled as Florida's first theme park it was famous for its fancy water ski shows. The shows went on to break over 50 Guiness book of World Records. It really grew in popularity in the 1950's and 1960's when a number of movies were filmed here and with many visits from various Miss America's. It was quite a place for Southern Belles to be photographed. As time moved on the gardens had to compete with other theme parks such as Disney World which is roughly an hour away. This lead to difficult decisions and changes in the park. It became an amusement park run under a couple of different companies. But now is part of the World's second largest theme park operator and is part of Legoland Florida. These historic gardens are still available for the people to walk through and to enjoy....but for the cost of admission to Legoland.